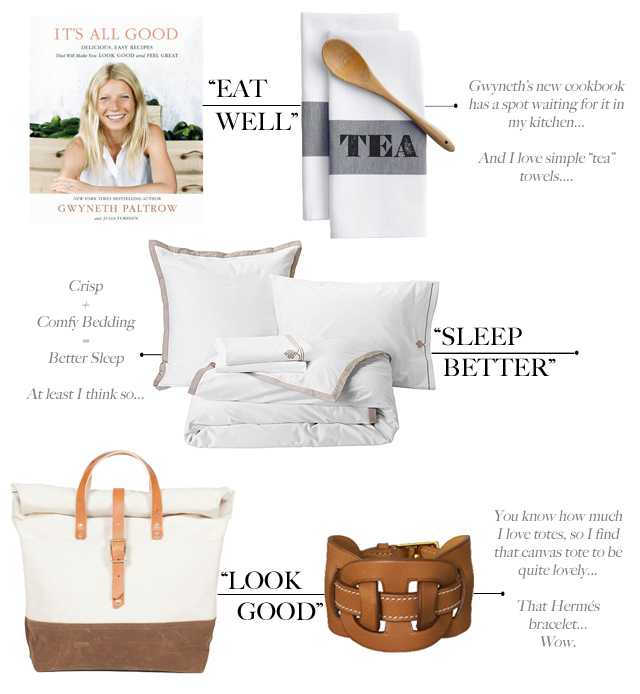 I love it all, but can't wait to get Gwyneth's new cookbook! lOVE IT ALL...but especially that Hermes cuff...so chic! Have a great day Tiffany, seeing that bedding makes me want to jump back in! I will start with that Bracelet!! But--I love it all!! I love how simple yet fresh and modern everything in this post is! Gorgeous and refreshing! Love those towels and the bedding -- I need new linens and these are perfect! I want all of this!!!! I melt when I see a bunch of things that I love. You've got great taste! I absolutely adore that tote and bracelet! Definitely want the new book my Gweneth + that bracelet....so pretty! Very nice collection. I can't wait for Gwyneth's book to be published. All that and double yes to the bedding...check! Thanks for the 411 on the book too!